In the early days visits by a priest were irregular, and Mass was celebrated in some private home. From 1842 to 1850 this corner of the archdiocese was looked after periodically by Dean Brennan, who travelled on horseback from Belleville some 30 miles south. In 1851 Father Begley was named pastor of Stoco and the neighbouring parishes. Father Quinlan succeeded him, and then for 20 years Father Lawlor was in charge. 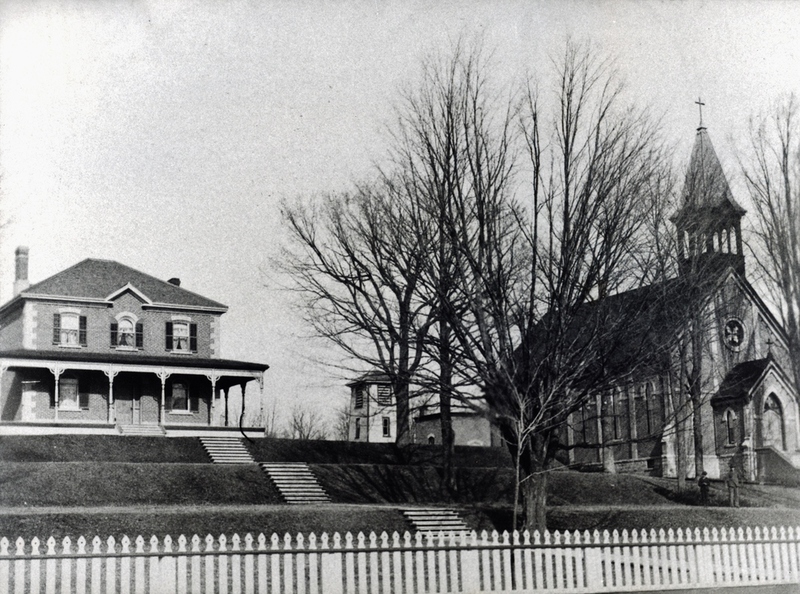 In 1879 Father Davis, pastor of the area encompassing Stoco, Tweed, Madoc, Queensboro and Marmora, moved his place of residence from Stoco to Madoc. To read more details of the parish priests, click here. 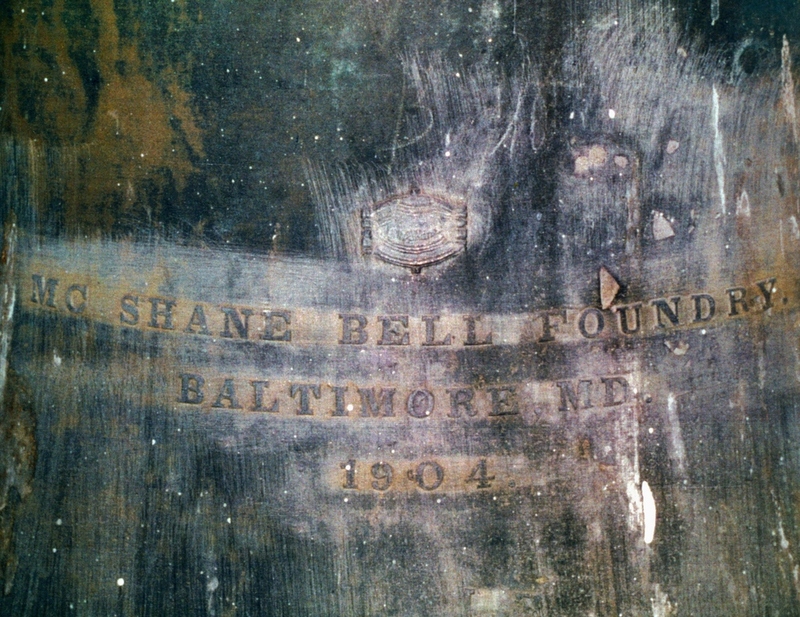 Click here to read about the McShane Bell Foundry that made the bell. 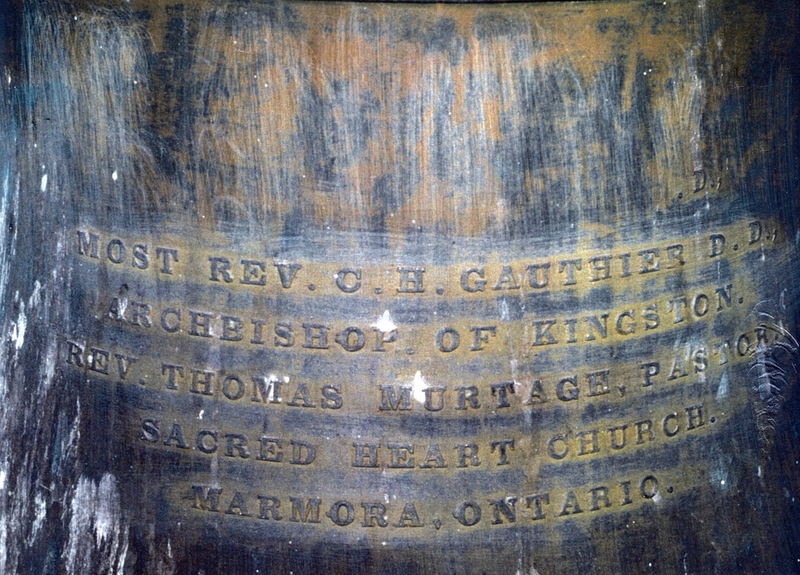 Marmora Herald, May 1915 Archbishop Michael Joseph Spratt of the Kingston Diocese visited the Sacred Heart Church, Marmora, on May 31,1915. There were 46 boys and girls in the class for Confirmation that Sunday. Each of the children took a solemn pledge to abstain from the use of alcoholic drink of any kind until after their 21st birthday. His Grace also took a strong stand in regard to some of the modem fashions and dances. He denounced the wearing of short sleeves as a return to barbarism. He said that some of the dances caused people to act like wild people and this was displeasing to the Almighty. This structure was not completed without altercations. 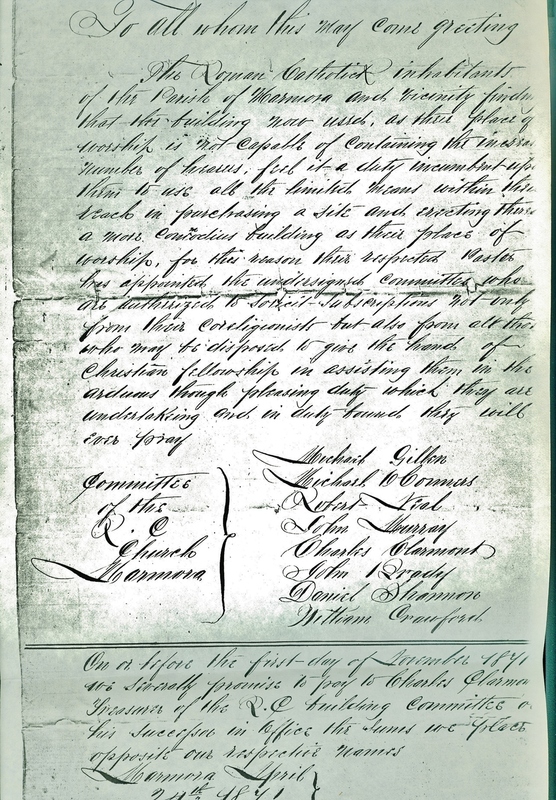 At one stage, the contractor, James McNeil, a Marmora man originally from P.E.I., locked the church until he would be paid "something on account". 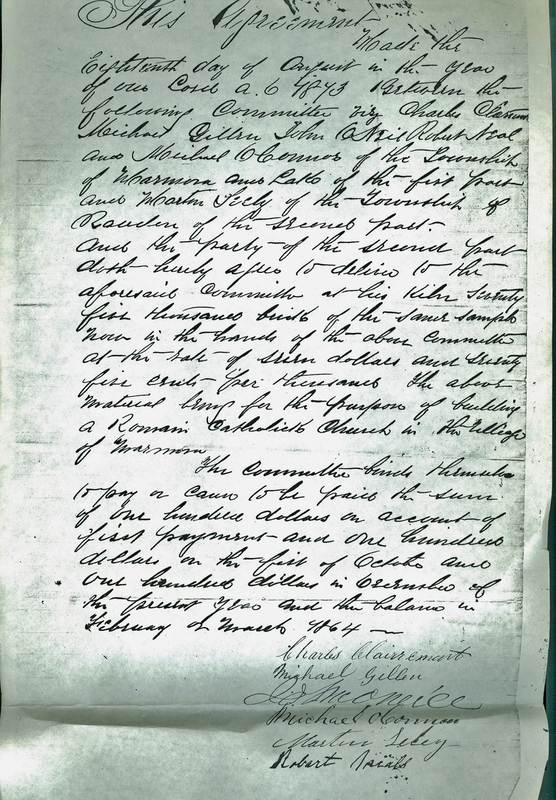 Father Davis' instructions to the building committee, contained in letters from his house in Hungerford Township and still on file at the Catholic Church, concerning pledges for the building of the church, are a reflection of a strong character, one might say. 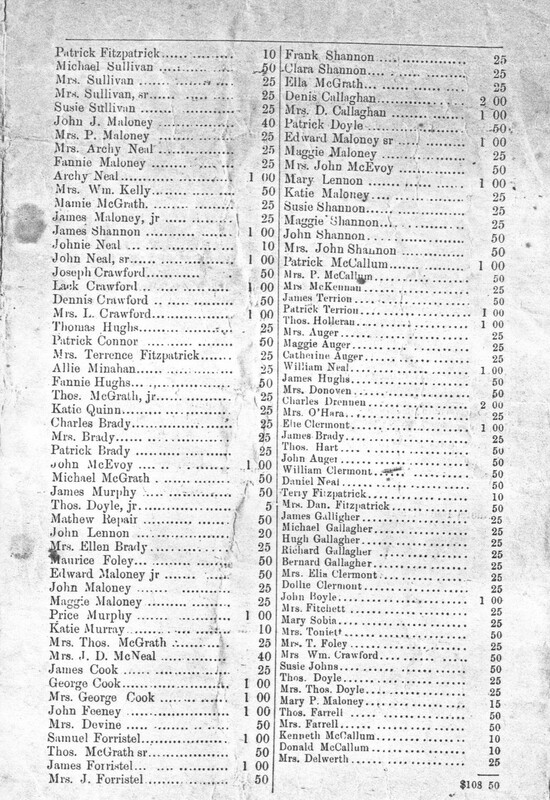 "Finding that you have today locked the church against the congregation..."
one printed leaflet was obviously inspired by the fifth commandment of the church; it is a list of parishioners' contributions for the year 1888, with the back cover devoted to a caustic commentary by Father Davis on generosity, or the lack of it. 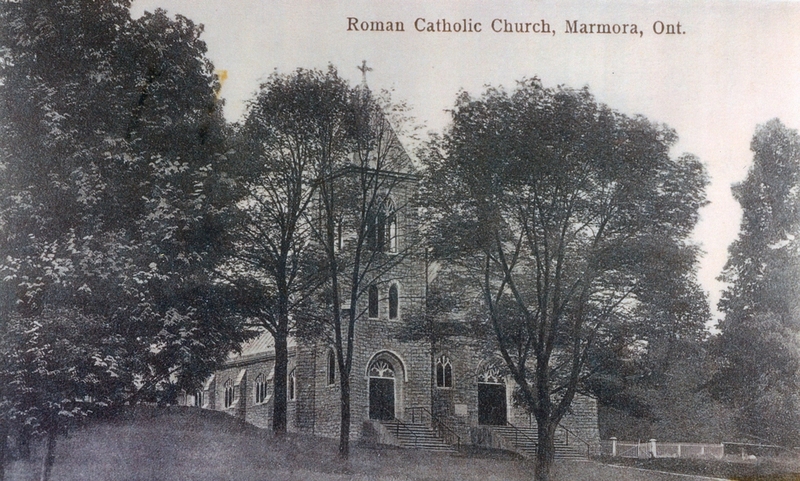 On October 26, 1894, when Archbishop Cleary visited Marmora to administer Confirmation, he announced that Marmora was to have a resident pastor. 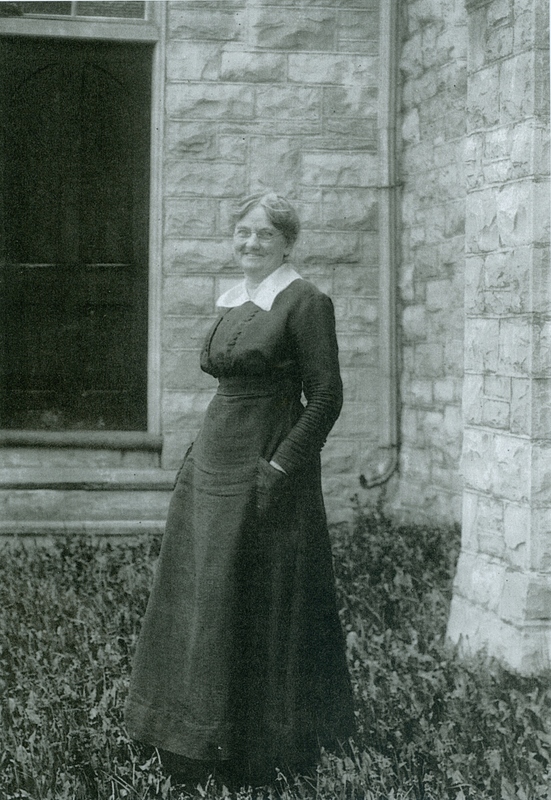 Father Thomas Murtagh was appointed, and one of his first challenges was to build the present rectory which was erected in 1895 at a cost of $1950. Archbishop Gauthier's first visit to the parish in 1896, to canonically erect the Stations of the Cross, was a milestone in the parish annals. His Grace was met at Marmora CNR station, three miles from the village, by the parishioners in a body, and, preceded by the village band, the procession travelled in dignity and style to the rectory. Rev. Thomas Murtagh suffered a heart attack on Feb. 28, 1920 after having suffered an attack of influenza in 1918 that left him weakened. 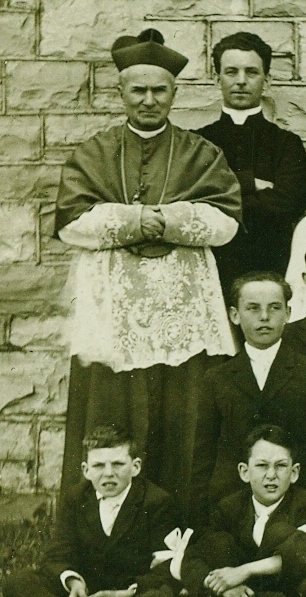 "Born in Ireland in 1863, he was educated at St. Nells College, Dublin, For three years after coming to Canada, he was attached to St. Mary's Cathedral, Kingston, and then appointed curate to the late Father Davis, Madoc. 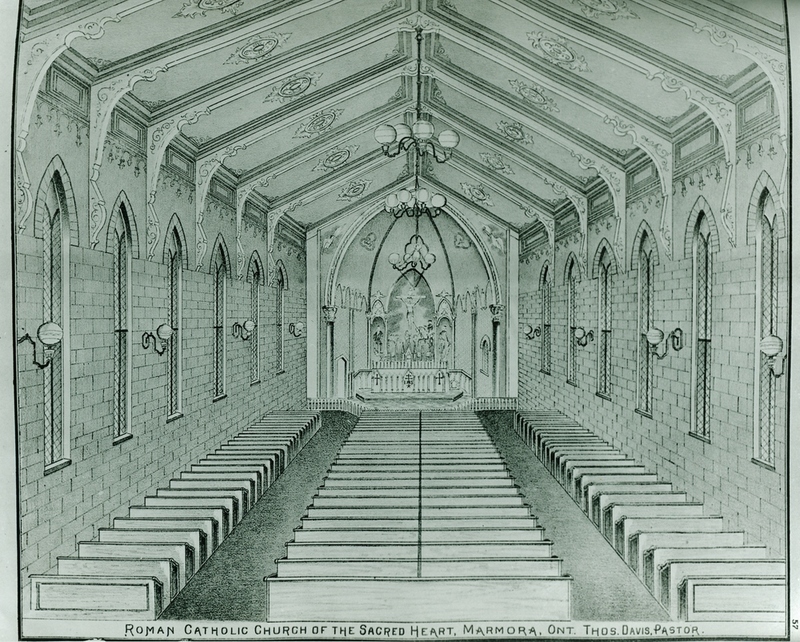 As a result of his great ability, the present splendid stone church was erected, the handsome and commodious presbytery built and furnished, the ground beautified, and the cemetery enlarged and the Separate School built. 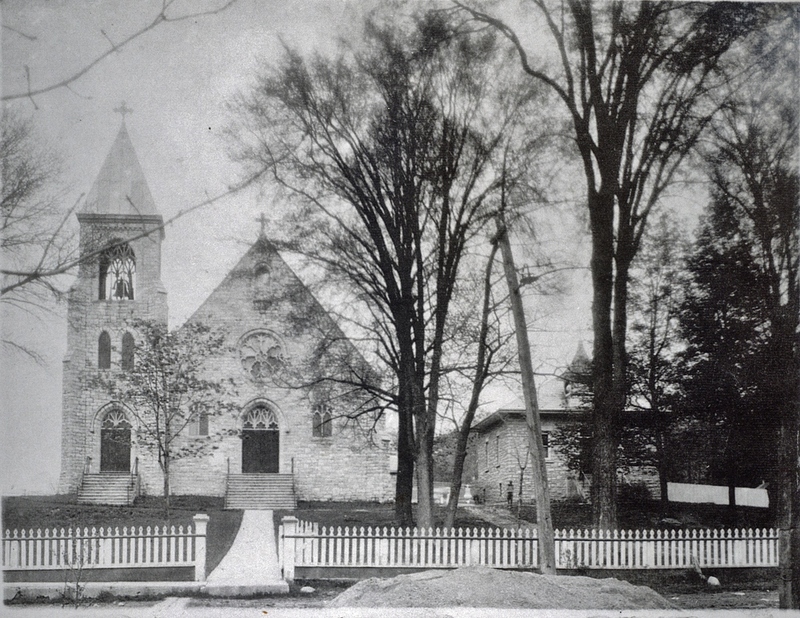 In 1903 the beautiful brick church in Marmora, recently cleared of debt, was hit by lightning and burned with all its contents. 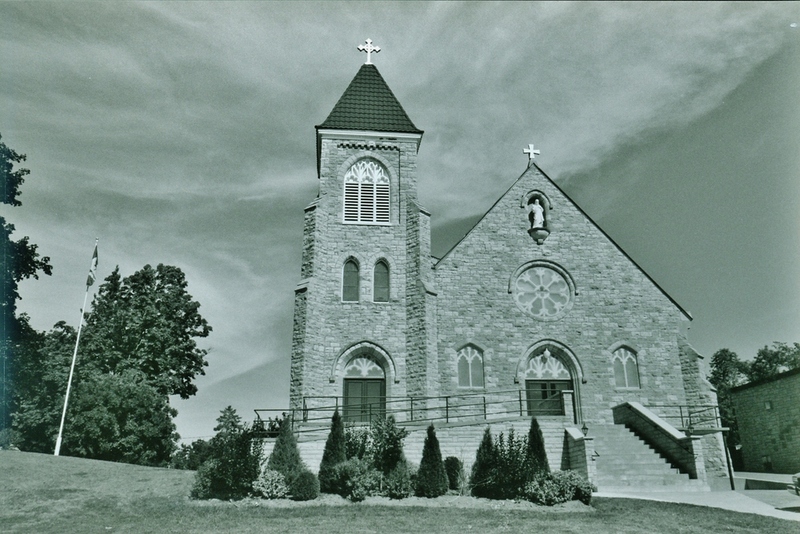 In 1904 Father Murtagh directed his courageous flock in building the stone church that now stands. The foundation was built by Richard Sheehy of Peterborough, for $1300; the superstructure by Caspar Speagle of Westport, for $11,460. The Archbishop had selected 6 men from 17 nominations made at a parish meeting, to form a "Committee of Management of Financial Affairs", one of them being co-treasurer with the pastor. There is no evidence that Father Murtagh encountered any such difficulties as Father Davis did with the contractors! 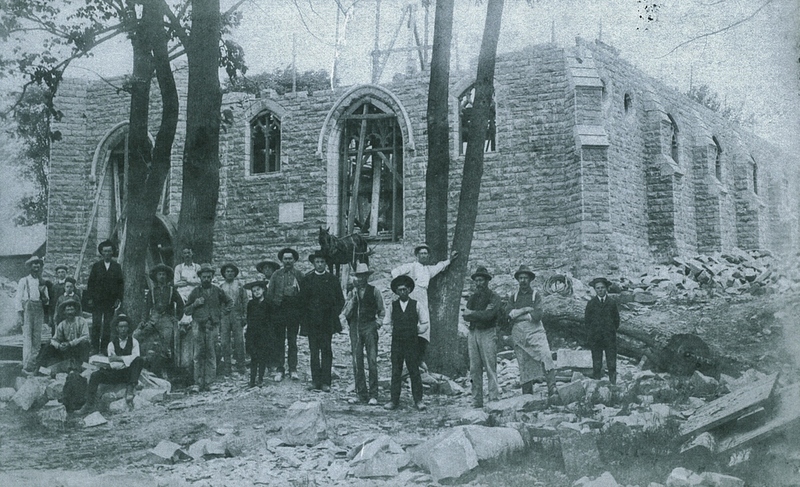 Archbishop Gauthier laid the cornerstone on May 8, 1904, and blessed the completed church on November 20, 1904 when the first mass was held. 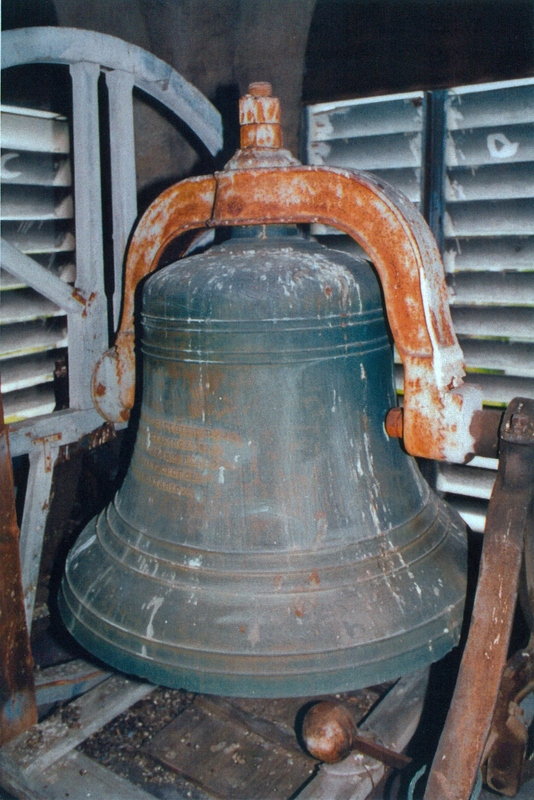 The Stations of the Cross were erected that evening; the church bell, christened Hugo Bernard, was installed the next morning. 1904 Blessing of the Cornerstone - Archbishop Gauthier, Also present: Rev. Thomas Murtagh, Marmora Parish Priest; Rev. Peter McGuire, Hastings; Rev. Whibbs, Campbellford; Rev. John Meagher, Madoc; Rev. P. McKiernan, Frankford and Rev. Fitzpatrick, Ennismore. Father Murtagh died in February 1920, and was buried in the parish cemetery close by the church he had built. In his 26 years in Marmora he had become a living legend. The names of the pastors who succeeded him are to be found in the list appended to this narrative. In the early church records, all hand-written, the visits of the various archbishops are the highlights of parish life. 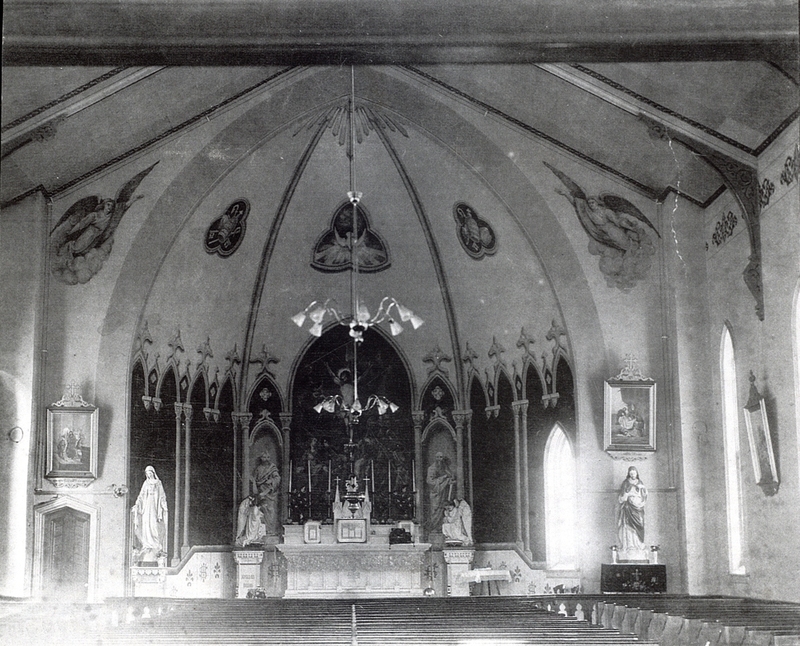 On Sunday, July 5, 1925, Sacred Heart parish observed its centennial with solemn Mass. Rev. Capt. J. F. Nicholson gave the sermon. The parish hall under the church was built in 1950, while Father J. A, O'Neill was pastor. Father F. J. Spence, during his year as parish priest of Marmora, was raised to the rank of Monsignor, and then consecrated Bishop. Native sons of Marmora who have been ordained to the priesthood include Father Donald Gillen, now retired in Calgary, Father Francis Quinlan, OMI, Father Wilfred Terrion, Father Leo Forestell, SJ, and Father Karl Clemens. 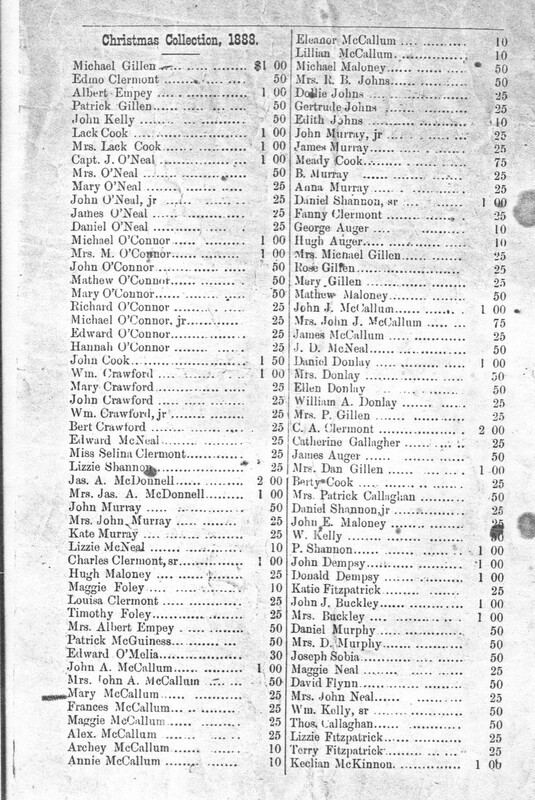 The list of parishioners in Sacred Heart parish, Marmora, still reads like a catalogue of Irish heroes, seasoned with a sprinkling of other European names. 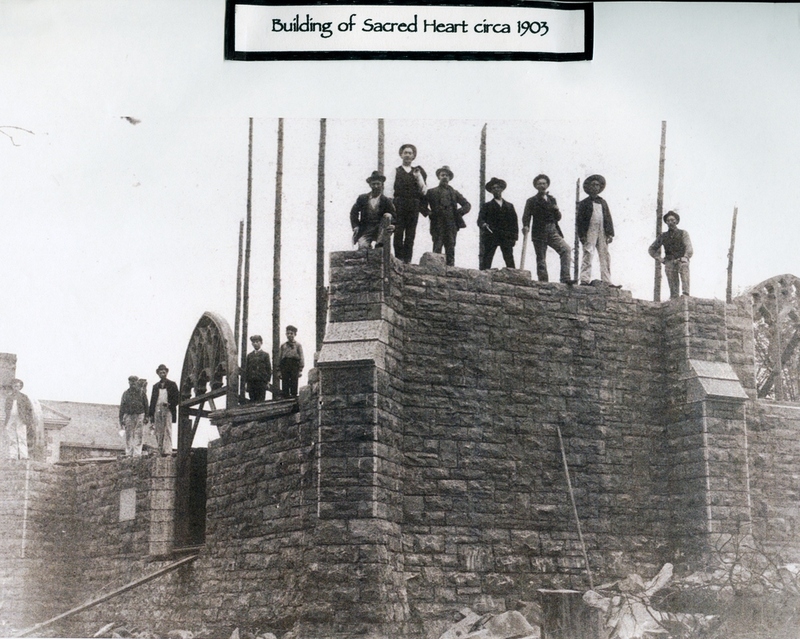 And we believe these parishioners still hold the strong convictions of those hardy pioneers who built their little church here150 years ago, and dedicated it to the Sacred Heart of Jesus. Click the stained glass above to tour the windows of the church in a video with Gabriella Hamley on violin. 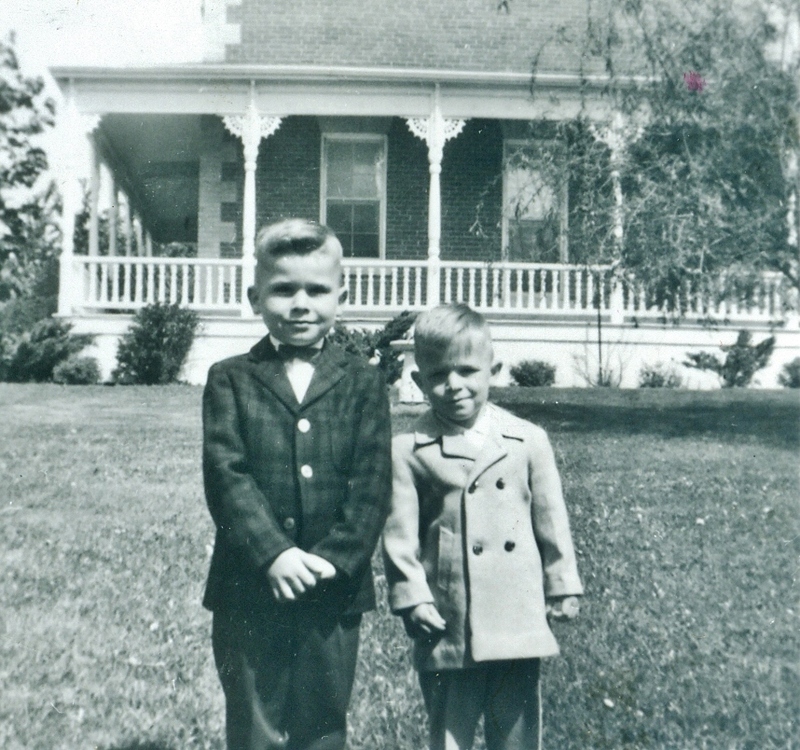 Shawn Hughes and brother Jodi "a long time ago"